Daksinamurti is an ethnologist and international psytrance artist from Marburg, Germany. Besides being a DJ he is managing the South Afrika based label TIMECODE and SANGOMA Records with Gata Freak from Doha. With more then a decade of experience as a musician he looks back to a colorful history – so far has represented labels like the legendary Shiva Space Technology, Nexus Media and is currently playing for Peak records. His live act 'Android Spirit" together with Tickets/Brethren launched in 2013 and after a couple of compilation appearances they are currently working on their album to be released on Timecode Records. 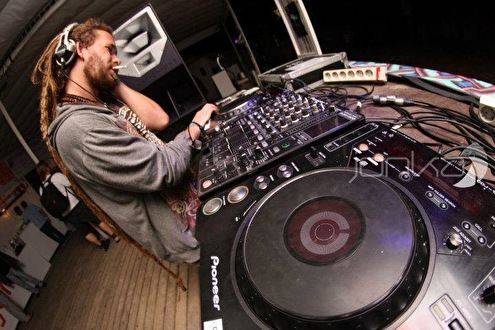 Till has built a solid reputation within the international psyscene and shared his music and good vibes at various parties and festivals such as: Boom (Portugal), Universo Paralello (Brazil), S.U.N Festival, Alien Safari (South Africa), Gemini , VuuV, Antaris, Fusion, Fullmoon Festival, Psycrowdelica (Germany), among others. Daksinamurti sees himself as an independent DJ who preferes to play sets that create a story which lead from night to light and therefore likes to play extended sets. Daksi's formula is a colorful journey through powerful psychedelic trance with strong grooves, organic/tribal soundscapes, filled with surprises, and sometimes even a blend of 'Goatrance" for right moments. Covering a wide range of music he is able to perform at any time of an event. His love for diversity is also reflected in multiple compilation releases he worked on or helped with.